Web Hosting | cPanel Linux Hosting | Windows Hosting by Colosseum Online Inc.
Colosseum Online Inc.'s award-winning shared web hosting packages provide the control, flexibility, and reliability needed to create a successful online presence. 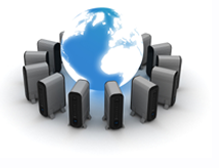 Colosseum Online Inc. offers a 99.9% up-time guarantee and 24 hour live toll free technical support. It's no wonder Colosseum Online Inc. is chosen time and time again as one of the top web hosting companies in the world. *Video streaming sites are not allowed. Prices subject to change without notice.